A beached whale has died in eastern Malaysia after swallowing a plastic bag, a rope and a bottle cap, a marine researcher said Wednesday. The 10-meter-long (33 feet) Bryde’s whale got stranded at the Kuala Nenasi estuary in eastern Pahang state Monday and died a day later despite villagers’ efforts to safe it, said Mohamad Lazim Mohamad Saif, a researcher with the Turtle and Marine Ecosystem Center, who was at the scene. Mohamad Lazim said the preliminary findings of an autopsy showed the female had swallowed a black plastic bag, a rope and a bottle cap, which clogged its intestine. “When they come to the beach, this means they want to die. Usually it’s like that,” Mohamad Lazim told The Associated Press. He said the sick whale may alternatively have ended up at the beach after getting separated from its pod and losing direction. Marine boats managed to pull the 3.9-ton (3.5-metric-ton) whale back into the sea during high tide late Monday, but that by Tuesday it was back on the beach. Villagers sprinkled it with sea water and covered it with wet blankets and a mattress, Mohamad Lazim said. The state’s veterinarian department will continue to examine the whale, which will later be buried near the estuary’s jetty, he said. 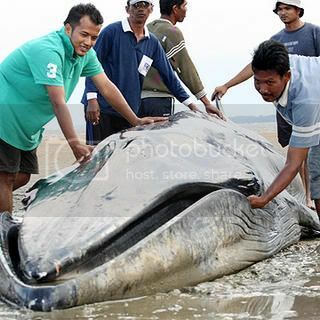 Another Bryde’s whale stranded and died in eastern Sabah state in Malaysia in 2006. Bryde’s whales are members of the baleen whale suborder and are found in tropical waters. That’s unfortunate that the whale died because of our laziness to properly discard trash. Also amazing that an animal of that size could die from swallowing a rope, bag, and a bottle cap, but since it feeds on plankton and other smaller items it’s entirely possible. I can’t believe the crap us humans are doing to the earth. When I was a kid I through something out the car window. My mom stopped the car and made me go pick it up saying the earth was not a garbage can.